ESCAPE THE CONFINES OF THE CITY.TAKE FLIGHT ON THE OPEN ROAD. The Alfa Romeo logo of today represents the same qualities now as it did at inception, over 106 years ago: a passion for driving unlike any other. Visceral. Energetic. Technological. Crafted. Yet the DNA of one of the world’s most revered brands runs deeper than just its historic badge. It runs straight from the heart of Italy, to roads and drivers all around the world. 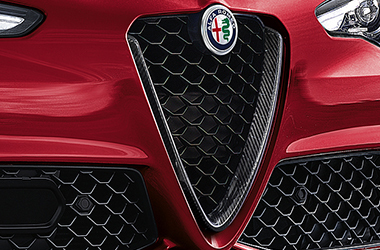 This iconic badge now belongs to the All -New Alfa Romeo Giulia.The most exclusive Giulia in the range will surprise you. Giulia Veloce Ti: an even more captivating style for Giulia Veloce’s sporty soul. In addition to the iconic appeal of its Italian design, Giulia Veloce Ti also boasts an even richer array of interior and exterior fittings, which with their incredible attention to detail further enhance its exclusive appeal. The most exclusive Giulia in the range will surprise you. Characterized by unique Carbon fibre finishes and seats in black leather and Alcantara, the sophisticated and sporty interiors are completed by leather dashboard, standard for this version. Differentiated tyres and aggressive and stylish 19” design dark alloy wheels. Carbon fibre exterior finishes for the iconic V Trilobe, mirror caps and badges. Available on request: sideskirts with carbon fibre inserts and a carbon rear spoiler distinctive of Quadrifoglio aesthetics. It’s equipment without compromise onboard the Giulia Veloce Ti. 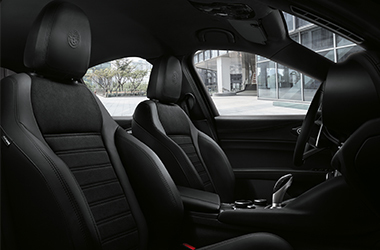 In fact, the Giulia Veloce Ti combines all of Alfa Romeo’s style with exclusive comfort. The emotion comes from the boldness of the interiors with its array of unique details and the elegance of the striking lines of the exterior, made even more special by the burnished miron badge and exhaust tips. But the most surprising thing is the richness of the standard equipment. and occupants, and to serve as a reminder of how serious Alfa Romeo takes each occupant. The seats are adjustable; our respect for the driver is not. More than just the best power-to-weight ratio in its class – the Alfa Romeo Giulia Quadrifoglio is a study in how to use that power. Its ideal 50:50 weight distribution creates optimal balance and showcases the advantage of a rear-wheel-drive system in a front-engined vehicle. 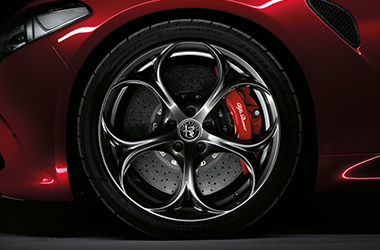 By pairing rear–wheel drive with the Alfa Romeo Giulia Quadrifoglio’s front– mounted, all–aluminium 6–cylinder engine, the Alfa Romeo engineering team have been able to carefully distribute weight throughout the chassis. A body in high–strength steel, wings and doors in aluminium, a carbon fibre bonnet and roof, and aerodynamic body and driveshaft all work in conjunction with an all–aluminium suspension to create a perfect motoring balance. the first two scheduled maintenance appointments. warranty; a courtesy vehicle is always available. a day, 7 days a week, for information or roadside assistance. The availability of services could vary depending on the market.